The recent revelations that President-elect Obama has been reading Doris Kearns Goodwin's recent biography of Abraham Lincoln, Team of Rivals, left me somewhat puzzled. He's reading the right author but the wrong book. The book he should be reading is her biography of Franklin and Eleanor Roosevelt, No Ordinary Time. Like FDR, Obama will be entering office facing what can only be described as an economic catastrophe. 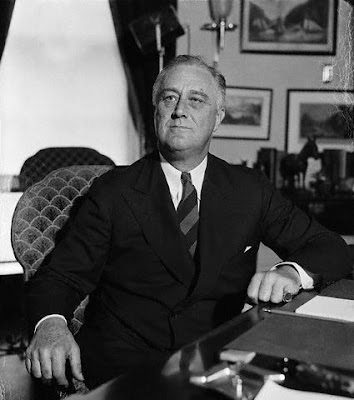 And as the American people looked toward Franklin Delano Roosevelt with a renewed sense of hope and expectation, Barack Obama's election has a large part of this troubled country feeling the sort of hope that they have not known in decades. This is something the extreme Right Wing has never been able to understand. The actions of the Bush White House to the current economic meltdown is all the proof you need to establish that fact. The economy is collapsing? No problemo, muchacho! Just pump America's treasure (or what's left of it) into the coffers of the two percent of the people who control over three quarters of the nation's wealth - not the people who are gong to spend it and pump it back into the economy - but the ones who will merely hoard it. Now that makes perfect sense! I need a drink. ' Here's what's happening: The plutocracy is in the process of looting our national treasure. This has actually been going on since the day Bush took office eight years ago this January 20. They're now making the final assault. If you think the situation President Obama will face is a mess now, Just you wait, Henry Higgins, just you wait. As bad as the situation is now, it's nothing compared to what it will be come Inauguration Day. Consider this: Most large retail businesses operate all year long in the red. It is the Christmas shopping season they depend on to put them back in the black - and that's just not going to happen this year - COUNT ON IT. The holiday season of 2008 is unlike any other in over three-quarters of a century. The most wonderful time of the year? Not this year, Santa! People are hurting in 2008 - Hurting badly. They're not going to go out and piss away seventy percent of their pay checks on presents and flub dubs. They need to survive. You just wait and see how many businesses fold after the new year. It ain't gonna be pretty, Bubbah! As bad as things are now, Barack Obama's first day in office is almost certain to find them much worse. The most disconcerting thing about his proposed cabinet is the make up of it. All of these damned Clintonistas! I don't know about you, but that's not necessarily the kind of change I can believe in. I changed my political registration a decade ago from Democrat to Green - and Bill and Hillary Clinton were my primary reasons for doing so. The one thing that can be said in their favor is that the presence of so many Clinton people in the new administration will at least guarantee a good degree of hands-on, government experience. Let's hope they don't blow it. ' Clinton was, in many ways, a good and competent chief-executive. He was certainly head over heels better than the a**hole whose term of office is about to mercifully end, that's for damned sure. But President Clinton's major sin, as far as yours truly is concerned, is the fact that he and his once-great party forgot that they were the party of Franklin Roosevelt. He didn't put a stop to the GOP's assault on the New Deal that began with the election of Ronald Reagan in 1980, but merely passively enabled it. One can only hope - indeed one can fervently pray - that the Clinton people have learned a lesson from their errors of the past. It's the only hope we have. Barack Obama would do himself a big favor by having a look at Ms. Goodwin's other book. If you listen to the recorded speeches he made all those many years ago - his inaugural address and his famous Fireside Chats - the phrase that keeps popping up is, "Action, NOW". Some of the action he and his Brain Trust took was bold and experimental. Some of it was unsuccessful. But he saved this country by "tempering the excesses" of capitalism. Don't listen to the half-witted revisionists on the Far Right. Their historical talking points have always been that Roosevelt's entire administration was a failure; that his policies actually made the economic situation worse and prolonged the Depression; that he knew the Japanese were about to invade Pearl Harbor and he allowed it to happen - it's all nonsense. If there is a president that Obama will do well to emulate, it is not by any means Abraham Lincoln - great president though he no doubt was. The situation the Great Emancipator faced, as serious as it was, was totally different than the one facing FDR - and Barack Obama. Nobody survives from the Roosevelt administration to act as technical advisor so Obama and his people will need to rely on a careful study of the historical record. That is not to say they should parrot the New Deal note by note. Obama needn't get a pair of prince nez spectacles or restart his former smoking habit with a cigarette holder. While there are many differences between 1933 and today, there are also a good deal of ominous similarities. They should carefully pick and choose what may be applicable for modern times and what may not be. Their best mode of operation? They should be bold but thoughtful; careful but feerless The only thing they have to fear is....well, you get the idea. Will the Obama Administration be successful? His chances of success are about as good as Jimmy Carter's were thirty-two years ago. What the people who love to disparage his reputation always conveniently omit from their tirades is that Carter inherited a disastrous economy from the Nixon/Ford years. Instead of making delicious lemonade out of the bag of nasty tasting lemons he was handed, he whipped up a pitcher of donkey piss. The biggest challenge Barack Obama faces will be how he responds to the current crisis. Of this we may be certain: He will be so much more able, responsible and competent than George W. Bush, even his failures (and there will be some) will seem like successes. ' When the sun rises on the morning of January 21, 2009, his first full day as president of the United States of America, no other human being on the planet will be shouldering a greater burden than President Obama. No American president since Franklin Roosevelt has had bigger man-made obstacles to overcome. I sure as hell don't envy the guy. Did you happen to catch FDR's grandson, Curtis Roosevelt's lecture at Hyde Park on C-SPAN 2 last weekend? It was taped on November 9 and will probably be repeated in the future. I was the questioner who asked him to speculate (and it was only speculation, mind you) what his grandparents might have thought about the current president. Lovely man. He signed his latest book for me afterwards. In fifty-five days this disgusting administration will be history!